Well it’s finally here. The LA Opera production of Wagner’s Das Rheingold opened last Saturday and I caught the second performance on Wednesday night. It has to be seen to be believed. And I mean that in a good way. Now, make no mistake, it’s not an ideal production in terms of singing and the Dorothy Chandler Pavilion acoustics do not help with the peculiarities of the Achim Freyer staging. But this is undoubtedly a no-holds-barred unique evening of musical theater and one, I dare say, you’d be unlikely to see anywhere else on this side of the Atlantic. It's a spectacle in nearly every sense of the word. Freyer’s visuals are often beautiful, unpredictable and nearly always engrossing. It is not a narrative or literal staging, but one that builds on Wagner’s own sense of the symbolic. Scenes are infused with multiple and often overlapping images that represent many things, and over the evening, one begins to adapt to this system of Freyer’s own creation. Of course, all of the touches you’d expect are there, singers dressed in masks and often absurd or surreal costumes, Doppelganger actors performing actions that the vocalists are singing about in other parts of the stage, and a rough-hewn almost cartoonish style. His bag of tricks is really superb in this context. The stage is centered around a large rotating circular platform raked at a steep angle that serves as a changing locus for much of the evening’s action. The entire performance takes place behind a scrim that covers the entire proscenium and beyond creating a screen for several different visual and light projections. Everything is then sandwiched between two rows of bright neon lights that at times represent the Rhein and at others the horizon or other geographical features. Wotan's wandering lost eye even makes an appearance hanging out at the fool of the stage throughout the whole evening. It’s almost more than can be absorbed in one sitting and that in my book makes it well worth seeing. The orchestra under James Conlon sounded excellent, but it is true that the sound is often distant since they are covered over in a pit below the stage level due to the requirements of the production. On the plus side, this gives the vocalists a bit of a break in that being heard over the orchestra seldom seems to be a problem for anyone. As I also mentioned, while the singing was solid overall, few of the performers gave anything close to career defining performance. The central players, Vitalij Kowaljow's Wotan, and Arnold Bezuyen's Loge were robust and accurate, but not earth shattering in and of themselves. A perfectly pleasant Michelle DeYoung makes her company debut as Fricka and as with Loge and Erda, has more hands than she knows what to do with. Fricka's do have the additional benefit of lighting up in the dark though. Some people who normally are exemplary, like Jill Grove as Erda, seemed lost in the acoustical challenges of the hall and the production. But, this is Wagner which is seldom perfect. Additionally, as the second performance in an expansive year and a half of performances, there is still plenty of time for all of this to settle in together. It's already an intriguing and wonderful staging and with a little time, it looks like this will develop into a Ring cycle for the record books. 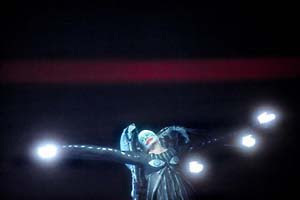 The show runs through March 15 with the next installment, Die Walküre opening on April 4. I was at last night's performance as well. I think your comments nailed it. Solid but seldom remarkable singing. Superb orchestra. Adventurous design and staging with the occasional awkwardness and confusion that accompanies risk taking. But when it worked, it was as magic as anything I've seen on stage.